ForestEthics: Franke, thanks for joining me. There are countless ways to approach climate activism. Why did you choose visual essays? Franke: Thanks for asking me! Delighted to be here today. Well, first off, I’m an artist and storyteller so visual essays are a natural — and fun way — to express my ideas. But getting to your activist point — art and political activism are the absolute perfect marriage. There’s a long history of art being used to help further social causes — women winning the right to vote, anti-war demonstrations, Earth Day — I fit right into that groove, which is neat. It’s also fun to realize what sets artists apart from scientists and journalists. We can weave symbols, facts, opinions, thoughts, emotion and color all together to raise awareness and inspire action. Sometimes I think that artists are like ad agencies for the planet. It’s not just that I am creating visual stories for a paper book, or to hang on the walls of a gallery. No, the really powerful tool we have today is that the stories are posted on the web and can be shared with just the click of a button. Zoom! 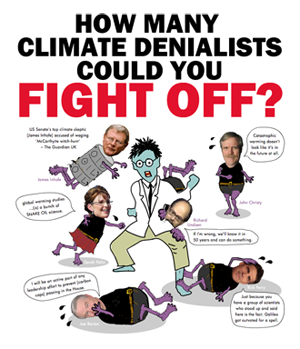 To give you an example… For my new illustrated quiz “How many climate deniers can you fight off?“, we created a map showing who has played it. It’s only been up for a few weeks and already it’s been taken 3,200 times and spread to every continent (except Antarctica). That is very cool. It’s more proof that there are lots of people willing to stand up and fight climate denialism. In the age of the cellphone, social media and the internet, activist art is a very powerful tool for social change. That’s why some governments want to suppress activist art. I also want to give a hat tip to ForestEthics. You are masters at using words and pictures to inspire change — your Victoria’s Secret campaign stands as one of the best examples of strategic activist communication ever. I’ve talked with people working in forestry and they tell me that that ForestEthics campaign changed the forest industry for all time. Wow! Great job! ForestEthics: 2. Many of your visual essays are honest, and you seem to take personal responsibility for the all-to-common behavior impacting our planet’s health. How has your lifestyle, or quality of life, changed since you began taking this approach? Franke: Thanks! Totally changed our life and all for the better. It’s fantastic — and certainly my family and friends view me differently now that they can see the concrete actions I’ve taken in my lifestyle, and how it’s benefited our family. But there is some dark humor to it. When we decided to sell our car to reduce our carbon emissions, one of my brother-in-laws called us “granola crunching, tree-hugging, whack jobs”. He was only partly joking. You have to be prepared to get some negative push-back because by changing your lifestyle you’re actually challenging other people to reassess theirs. This is an important point — after all these changes, I view myself differently too. We made changes in our lifestyle that initially looked really tough — but then ended up improving our sense of well-being so much that we’d never go back! So what have we done? Well, we sold our only car so we get a lot more exercise now. We got rid of our driveway — and after fighting a bureaucratic City official — we won the right to build a green driveway, so now we have a front yard full of trees and plants. We also eat differently now: we’re weekday vegetarians and we buy organic as much as possible. But getting greener is a process—it didn’t happen for us overnight. ForestEthics: 3. 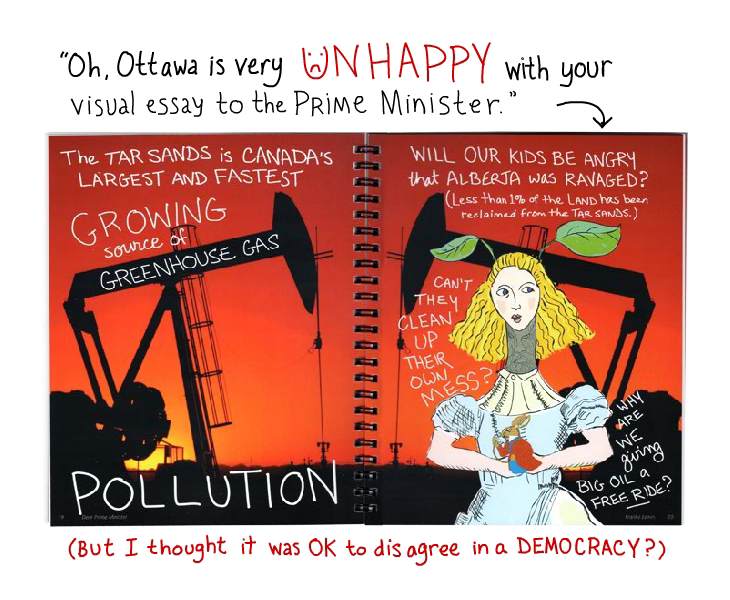 Other visual essays you’ve done call on the Canadian Government to do the right thing for the environment, which seems like a perfectly reasonable exercise of free speech. Then, the Harper Government blacklisted you in Winter 2011. That’s some activist street-cred, Franke! But really, how did you handle that blacklisting? Franke: Initially, I was shocked to hear that the Canadian Government was interfering behind-the-scenes and warning people not to show my art because it was “against government policy”. It’s a bully-tactic that is so outrageous that it belongs in a George Orwell book (and will be in my new book!). Get help from friends: I reached out to high-profile people I knew for moral support. Bill McKibben, Tzeporah Berman and environmental groups like 350.org, and Change.org provided quotes which I posted on my site, and used in emails and press releases. Collect evidence: I submitted access to information (FOI) requests to get internal government records. I now have over 1,500 documents that show how Canadian Ambassadors and Trade Commissioners were working behind-the-scenes to dissuade people from supporting me. Go public: I believe that the best strategy to fight a bully is to shine a bright light on the bullying. Get as many eyes looking at the problem as possible. I went public on Twitter, Facebook, and my site telling everyone what was happening, in real time. That brought an outpouring of support — friends on Twitter and FB started petitions and introduced me to people who could help me fight back. Ask for help: Through social media, I met LoudSauce founder Colin Mutchler whose company does crowd funded media campaigns. With his help (and many people on Twitter), I was able to raise the money to have an outdoor protest art show in Ottawa, just around the corner from the Parliament Buildings. Host a Party! I hosted a blacklisting party to help raise funds for the art show. It also was a great morale booster showing me how many people were in my corner! Make activist art: I created a visual essay and video called “Banned on the Hill” about the government blacklisting and the protest artshow. It’s been shared around the world and will be in my new book. Make lemonade from lemons: Since November 2011, I’ve been giving talks and participating on panels about the intersection of art, censorship, and politics. This weekend I’ll be on the Canzine panel “Chill Against Political Dissent in Art“. Because the government’s bullying is affecting many in science, arts and culture. The bottom line is that I would much rather have had the 20-city show in Europe – which the Harper Government denied me – but I’m making lemonade from lemons. My attitude is that my real-life experience of being blacklisted is what great art is made of. How rare is that?! ForestEthics: 4. What’s the most “radical” thing you’ve ever done? Franke: Well, my family thought that us selling our SUV was pretty radical. But in all seriousness, “radical” is a very touchy word these days! 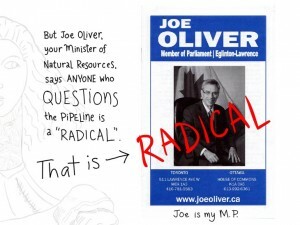 It’s a label that’s been thrown around by our Minister of Natural Resources, Joe Oliver to hurt the environmental movement. I know the Administration has called ForestEthics ‘radical’, too. The Canadian government is intentionally pushing environmentalists into a corner and labelling them as such because they know that “ordinary” people don’t want to associate with “radicals”. It is absolutely normal and healthy to want clean air and water. Every citizen should want that. And every citizen should be willing to stand up and demand good legislation that protects our air and water (and the planet). We need lots more people willing to do that! ForestEthics: 5. 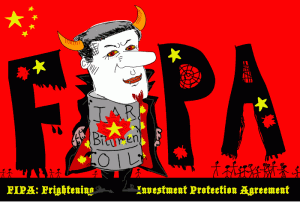 There’s a secretive China-Canada trade deal on the table right now, the Foreign Investment Protection Agreement (FIPA). 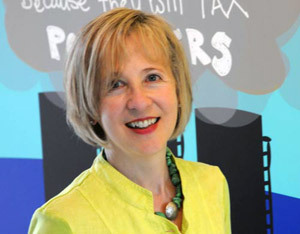 It would allow foreign corporations to sue the Canadian Government behind closed doors. This could seriously hinder the democratic processes needed to protect Canadian resources. Will there be an uproar from citizens and Parliament? Franke: The FIPA deal is unbelievably sick. It’s basically a sell-out of Canadian natural resources to China. As you point out, it allows foreign companies to sue the Canadian government in secret hearings. That’s where you and I have an opportunity… We can help spread the word. We can sign the petition on the Green Party site. And sign LeadNow’s petition. So far 33,900 Canadians have signed – but we need more. ForestEthics: 6. Not everyone can be a published visual essayist. Some people (like me) can’t draw a stick figure well. What are some of the most effective ways to get involved in climate activism? Franke: All you have to do is be willing to stand up and speak out. 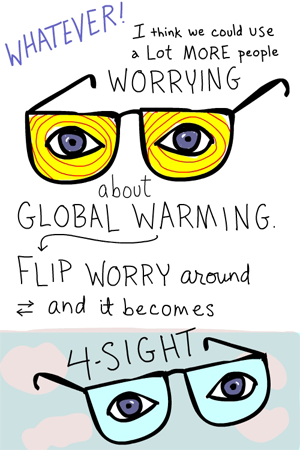 There are so many creative ways to be a climate activist. Sing, speak, write (including letters to your Federal and State representative and Letters to the Editor). Sign petitions. And surely one of the best is “act”. Lead by example. A group in Canada recently completed a 12-day fast for Climate Justice — in front of the Parliament Buildings in Ottawa. They succeeded in gaining media attention and support from Members of Parliament. We can also take action in our daily lives. I often tell people to “do the hardest thing first” for the planet. Each of us can choose to do something ambitious that will reduce our CO2. And then do it. Family and friends may take notice — and feel a wee bit jealous… and maybe that “peer envy” will motivate them to take action too. Years ago, no one recycled and now most people do. We need the same shift on climate action, so we get to the point where driving a carbon-spewing SUV is seen as very uncool and anti-social. ForestEthics: 7. What’s next for you, Franke? 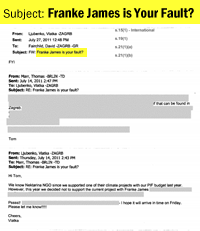 Franke: Shhh… I’m working on a new book to be published in 2013: “Franke James is Your Fault?” Oil, art and censorship. The title comes from an actual Canadian government email sent from Berlin to Zagreb. The book will be a large format ‘art’ book in hardcover and paperback. It will include my political environmental essays on Canada and the U.S. from 2008-2012. ForestEthics: 8. How do you stay fresh and creative for days, months, years on end? Franke: Life just keeps getting more interesting… Every piece I do is a new challenge. They are like really hard puzzles, and I just feel very lucky to be able to express my thoughts this way. On the other hand, if I could sing — that would be very cool. Because music is transformational and can make people feel great. ForestEthics: 9. If you could have any super power, what would it be? Why? ForestEthics: 10. Finally, what’s your favorite tree memory? Franke: When I was growing up in Toronto, my family had a great old apple tree in our backyard. My older sisters and I would climb its branches (they always climbed higher than I did). And we had great fun making “apple goulash” – that’s a special mix of rotten apples and dirt. I laugh just thinking about it. Lots of great memories.